The county of Galway is on the west coast of Ireland, in the province of Connacht. It is Ireland's largest Gaeltacht (Irish speaking) region. Within County Galway is Connemara National Park, offering scenic mountains, expanses of bogs, heaths, grasslands and woodlands. There are three main walking routes throughout the park each one offering spectacular scenery and wildlife. There are also some lovely picnic areas and nature trails. A popular trip is to the the Aran Islands, situated at the mouth of Galway Bay, Ireland. Galway has many castles and ruins to visit and Ireland's only fjord, Killary Harbour, in Leenane, County Galway. Galway City, located at the mouth of Galway Bay is beautiful and lively city with culture, locally owned speciality shop and plenty of nightlife. The Western Citypoint Apartments Galway. 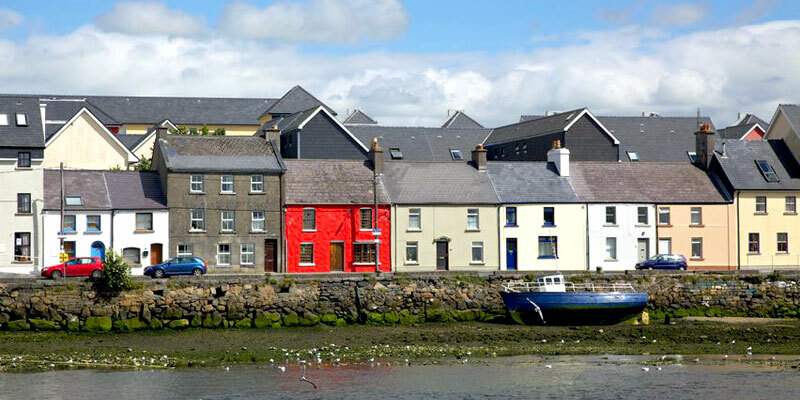 Holiday Apartments in Galway, County Galway. Ashtons Guesthouse B&B in County Galway. Bed and Breakfast in Clifden, County Galway. 3 star Bed and Breakfast in Galway, Ireland. Gannon's B&B Galway. Bed and Breakfast in Clifden, County Galway. Connemara`s Twelve Bens Mountains provide hikers and walkers with the most scenic and memorable days! Historic site where John Alcock and Arthur Brown crashlanded after their epic 1st Transatlantic Flight from Newfoundland.